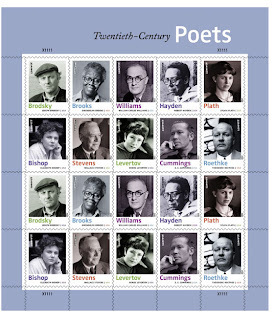 In 2012, the United States Postal Service will be releasing 10 Forever stamps featuring 20th century poets. “With the issuance of Twentieth-Century Poets, we're honoring ten of our nation's most admired poets,” says the USPS’s Mark Saunders. Elizabeth Bishop, Joseph Brodsky, Gwendolyn Brooks, E. E. Cummings, Robert Hayden, Denise Levertov, Sylvia Plath, Theodore Roethke, Wallace Stevens and William Carlos Williams will all be featured on Forever stamps, which are always of equal value to the current First-Class Mail one-ounce rate. The stamps were art directed by Derry Noyes of Washington, DC. Each stamp features a photograph of one of the ten poets while text on the back of the stamp includes an excerpt from one poem by each poet. Since the USPS was thoughtful enough to include a backgrounder on each of the poets who will be honored, we thought we’d include those brief bios here. After all, celebrating poets and poetry seems like a pretty good idea. Elizabeth Bishop (1911-1979) polished her poems to gleaming perfection, displaying the precise observation, intellectual strength, and understated humor that continue to win readers. Her poems walk the line between the marvelous and the ordinary and other contradictions. Joseph Brodsky (1940–1996) was an exile from the Soviet Union who became the first foreign-born poet to be appointed Poet Laureate of the United States. Although he embraced the country he came to call home, many of his poems resonate with loneliness and loss. Gwendolyn Brooks (1917–2000), another former U.S. Poet Laureate, is best remembered for distinctive, lyrical portraits of urban life. A master of traditional poetic forms, she also experimented with free verse, jazz and blues poetry, and colloquial language. E. E. Cummings (1894–1962) expertly manipulated the rules of grammar, punctuation, rhyme, and meter to create poems that resembled modernist paintings. His works transformed notions of what a poem can do and delighted readers of all ages. The poems of Robert Hayden (1913-1980) reflect his brilliant craftsmanship, his historical conscience, and his gift for storytelling. Many of his works render aspects of the black American experience with unforgettable vividness; others are more personal. Denise Levertov (1923–1997) hoped her poetry would inspire change. Weaving together public and private, active and contemplative, she perfected an organic form of poetry that explored the political and social world through the intimate experiences and perceptions of the individual. Sylvia Plath (1932–1963) probed the conflict between self and outward appearance. Her complex body of work includes deftly imagined poems about marriage and motherhood, gender and power, death and resurrection, and the sweet, enjoyable moments of everyday life. Theodore Roethke (1908–1963) created intimate, introspective poems distinguished by lyricism and a sensual use of imagery. Best known for his poems about the natural world, he was profoundly influenced by the events of his childhood and mined his past for the themes and subjects of his writing. The work of Wallace Stevens (1879-1955) presents a luxurious banquet of language and meaning. Many of his poems -- some highly comic, others somber and spare -- explore the relationship between consciousness and reality. William Carlos Williams (1883-1963) was a doctor who typed out his poems between seeing patients. His work showed readers the extraordinary in the commonplace -- a broken bottle, a red wheelbarrow left out in the rain -- in deliberately plain language. No Robert Frost or Carl Sandburg??? Beautiful! It's about time our literary heritage received some greater public recognition. And let's not quibble about the list. The ones that ARE here and certainly deserving. Robert Frost was already honored with a stamp in 1974, and Carl Sandburg in 1978. What about Charles Bukowski?! Not only is he one of he greatest poets of the 20th Century, he also worked at the Post Office, and wrote a novel entitled "Post Office."